The Tale of the Spirit of Kindness is the fifth chapter in Yoshi Topsy-Turvy. 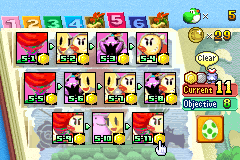 Before it begins, the Spirit of Kindness tells Yoshi that he must collect at least eight Happiness Medals in order to progress to the next chapter, but says she will punish him if he disturbs the peace. The first part of this mission takes place on a snowy mountain with a Basket and a small slope. The second part contains a few Ravens, a Wrecking Ball which can be used to destroy the Stone Blocks, and a few Shy Guys. The third part is an upwards area with a few Tap-Taps and rolled-up carpets. The fourth and final part has the player rolling a Boulder over a bed of spikes while avoiding Ravens on floating platforms. The first part of this mission contains brown lifts which act the same as green lifts and some parachuting bombs. The second part has green lifts as well as a Shy Guy Ship. The third part has the player rolling a Boulder over a bed of spikes while avoiding a few Boos. The fourth and final part takes place on a snowy mountain and contains three half-pipe ramps. The first part of this mission contains a single green lift and a Gusty with the bottom of the area being safe. The second part has a Ferris Wheel as well as an onslaught of Gusties. The third part is an upwards section containing a few multicolored sliding objects and a few more Gusties. The fourth and final part is a fall right into the Goal, but Yoshi is able to jump on top of the Gusties in this part to gain a few more points. The first part of this mission contains a few Fat Guys which can be bounced on to collect the parachuting coins that come down. The second part has three multicolored sliding objects that get smaller as Yoshi goes down and a bed of spikes below. The third part is a long auto-climbing area, but the place where Yoshi sits has what looks like rocket boosters on the sides. The fourth and final part contains both green and brown lifts with a set of spikes on the wall in the middle. The first part of this mission is a downwards area containing some Ravens and wall climbing. The second part has Yoshi transforming into Ball Yoshi with some Stone Blocks and a single Shy Guy and Piranha Plant. The third part takes place on a snowy mountain and has a single brown lift with a few small floating platforms with Ravens on them over a bed of spikes. The fourth and final part is an upwards section with many Ravens, some rolled-up carpets, and a few Igashira-kun moving on rails. The first part of this mission contains a few rolled-up carpets, Ravens, and parachuting Bombs over a bed of spikes. The second part is an upwards section containing some more Ravens as well as a few multicolored sliding objects. The third part has more Ravens as well as a few Wrecking Balls and a single Coin Basket. The fourth and final part has Yoshi transforming into Ball Yoshi and going into a downwards section with a few more Ravens and Stone Blocks. The first part of this mission contains a large amount a moving cups as well as a few Igashira-kun moving on rails. The second part is an upwards section and has a few multicolored sliding objects of varying sizes. The third part has a single Basket and a Shy Guy Ship and what looks like a dolphin anchor above the area. The fourth and final part contains three brown lifts, coins hanging from parachutes and balloons, and a few Igashira-kun in the middle of the area. The first part of this mission takes place on a snowy mountain and contains a few Ravens as well as low narrow paths that Yoshi must crouch under to move through. The second part has Yoshi transforming into Ball Yoshi and has a few more Ravens with Stone Blocks. The third part has some cannons with a few Igashira-kun, Ravens, and a brown lift. The fourth and final part takes place on a snowy mountain and has some high platforms with Ravens walking on them. The first part of this mission takes place on a snowy mountain and contains some low narrow ceilings that Yoshi must slide under to get to the end. The second part has two cannons as well as a steep slope and some Ravens. The third part is situated on a single platforms with Fly Guys that carry coins showing up. The fourth and final part introduces the Mace Guy enemies and contains a total of four of them. The first part of this mission has some small red sliding objects as well as two parachuting apples and Bombs. The second part contains three Chime Balls that Yoshi must roll over Chime Notes while avoiding a few Boos on the way. The third part contains a Wrecking Ball with some Stone Blocks along with two green apples. The fourth and final part contains a bouncing Goal that moves when the player tilts the console and a large green apple. The first part of this mission contains a single green lift along with some Shy Guys and a few rolling Igashira-kun. The second part contains two cannons which must be used to launch Yoshi over some high slopes and has a few Ravens in the way. The third part takes place on a snowy mountain and contains a few more Ravens along with a single Igashira-kun moving on a rail. The fourth and final part has Yoshi transforming into Ball Yoshi with a few Stone Blocks and Piranha Plants. This page was last edited on November 13, 2018, at 23:18.